SolIPInterfaceWatcher is a simple Windows application to watch changes of all IP(IPv4 and IPv6) interfaces on a local computer. 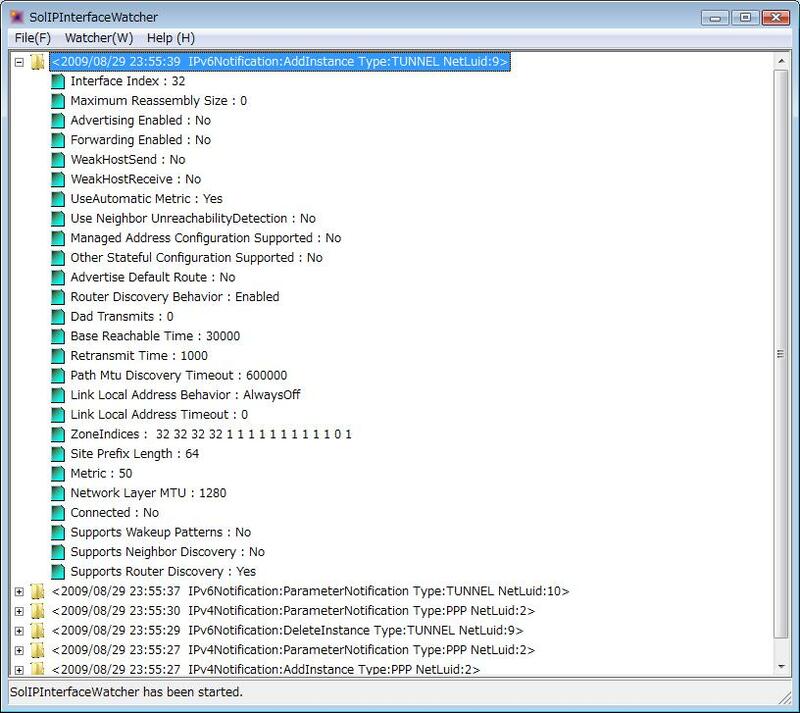 SolIPInterfaceWatcher can be used to watch what changes for IPv4 and IPv6 interfaces have been caused on the Windows systems. This tool is implemented by using a Windows Vista (and later versions) API 'NotifyIpInterfaceChange'. See also the console application 'src/console_app/net/IPInterfaceChangeNotifier' of SOL9 library samples. 1. Run SolIPInterfaceWatcher program on your desktop, then a Windows window will be displayed. See Figure 1. 4. The latest change of IP interface will be displayed in a treeview of the window.